By permission of Chris Hargreaves, editor of The Canadian Aerophilatelist, quarterly journal of the Canadian Aerophilatelic Society. Originally published in issue # 109, December 2016. 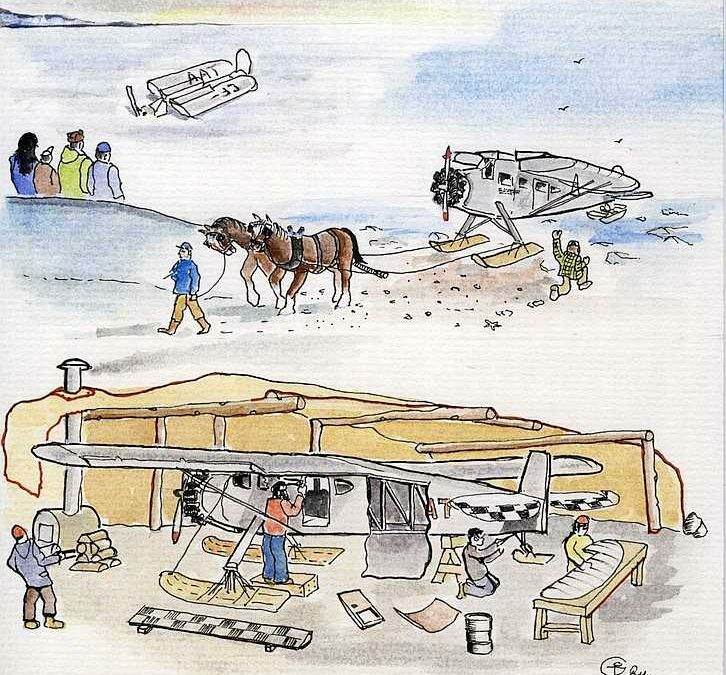 The story begins with an airmail “cover,” as collectors call an envelope with postal markings, featured in the Canadian Aerophilatelist five years ago. Editor Chris Hargreaves provides some background, below. Postmarked CARIBOO ISLANDS QUE FE 11 30. Handwritten endorsement on left side, probably “par voie aerienne” ( by air route.) Addressed to: Interprovincial Airways Ltd, Grand Mère, Qué. 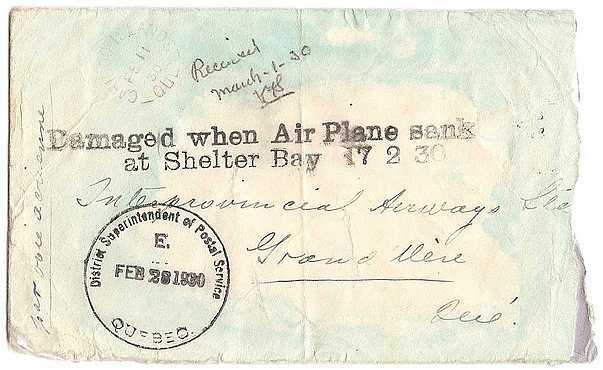 Two line handstamp: “Damaged when Air Plane sank at Shelter Bay 17 2 30″ Circular handstamp: District Superintendent of Postal Service Quebec FEB 28 1930 Handwritten note: Received March-1-30 and initials. This cover was first illustrated in the December 2011 Canadian Aerophilatelist. It was featured again in the March 2015 and June 2015 issues. It originated in Cariboo Islands, which was a hamlet on the North Shore of the St. Lawrence river, in between Godbout and Shelter Bay, which are two of the post offices to which mail was dropped on the North Shore air mail route. During the winter of 1929/30, there was a weekly dog sled mail along the North Shore from Betsiamites to Seven Islands and Havre St. Pierre. Outgoing mail from Cariboo Islands was normally carried by dog sled to Seven Islands, and then flown from Seven Islands to Quebec City. The annual report for 1930 submitted by Canadian Transcontinental Airways to the Civil Aviation Branch of the Department of National Defence established that the aircraft involved was a Fairchild 71, CF-AAT, which was assigned to the Quebec – Seven Islands – Anticosti Island air mail run. It had made an unscheduled landing at Shelter Bay on February 17th, and later sank through the ice. Diana Trafford has now discovered what happened in Shelter Bay during the night of February 17th/18th, and afterwards. Shelter Bay, where CF-AAT went through the ice, is now a suburb of Port-Cartier, Québec. The story behind the story… In June 2016 I spent two weeks in Winnipeg going through the extensive Canadian Airways Limited collection at the Manitoba Archives. As luck would have it, I requested the file of correspondence with the Stout Aircraft Company, a Ford subsidiary. In the same box, I spotted the pilot file for Alex Schneider and decided to check it out. Alex Schneider turned out to be the pilot of CF-AAT, the aircraft whose dip in the St. Lawrence River led to the mail getting wet. Although the cover that got wet in Shelter Bay was initially described as a “crash cover”, the mail got wet because of a parking problem, not a crash. For reasons no doubt related to weather conditions, Schneider landed on the shore ice at Shelter Bay (now part of Port-Cartier) and parked the aircraft there for the night. 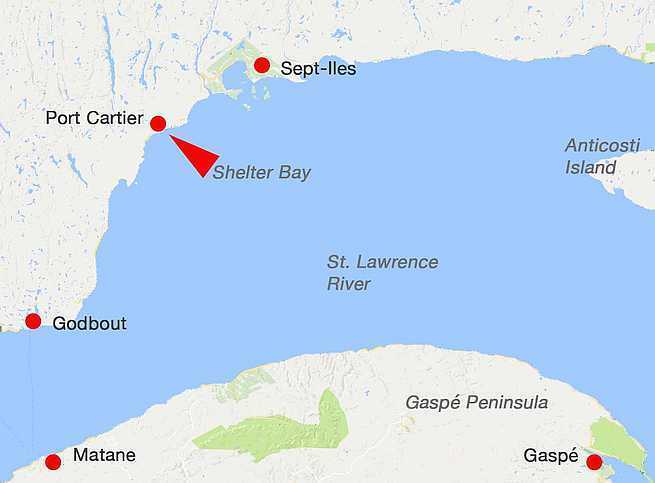 Remember that the St. Lawrence is a tidal river from Québec out to the Gulf of St. Lawrence. On a mail flight at Shelter Bay in February 1930, the Fairchild 71 CF-AAT was parked with folded wings overnight on the ice, about 30 feet from the shore. Shelter Bay is located on the North Shore of the St. Lawrence River. The bay was solidly frozen from the shore to 40 miles out. I did not believe him. “What have you been drinking, Caribou?5 He was so excited, he started speaking in French, his mother language: “Non, non, il est vrai, AAT est disparu‼” Well, I got up to see. As the tide went out, the aircraft reappeared. Every window except the front windshield was broken by the ice floes, and the whole plane was covered with a glistening sheet of ice. With horses, AAT was pulled ashore at low tide. We dismantled her and thawed her out under sails rigged up as a tent. A number of camp stoves were kept stoked to provide the heat for drying out the aircraft. Wood from orange crates was installed in place of the broken window panes. I flew the ship back to Montreal three days later. The native camp cook told me that never in his life had the ice broken up in February; usually break-up came at the end of March or in April. When Did Schneider Actually Reach Québec? After returning to Québec, CF-AAT was sent to Lac-à-la-Tortue near Grand-Mère, Québec, for complete overhaul in the company’s workshops there. 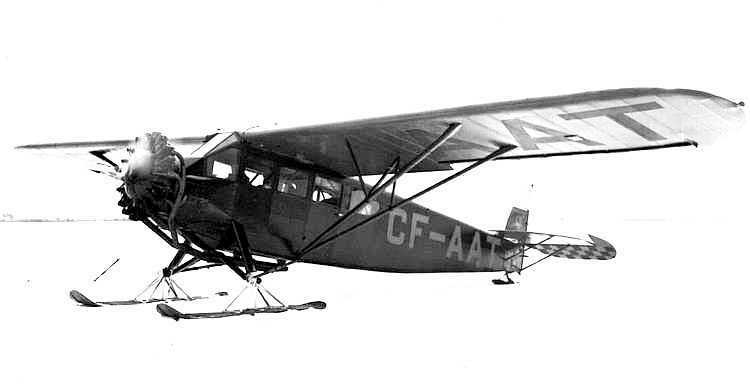 The aircraft was officially inspected and on 8 March 1930, was declared airworthy by the Civil Aviation Branch.10 Re-registered to Canadian Airways in 1932, CF-AAT would continue in service until March 1936 when an air lock in the fuel system led to a forced landing north of Sioux Lookout and the subsequent write-off of the aircraft. Alex Schneider had an illustrious 50-year career in aviation. Born in Germany in 1901, he learned to fly in 1918 in the German Navy Flying Corps. When commercial aviation resumed in Germany in the 1920s, Schneider was one of the first pilots engaged, working for Deutsche Luft Hansa and its predecessor companies. When he left Germany to immigrate to Canada in 1928, Schneider had more than 1,000 hours of flying time to his credit. He received his Canadian pilot’s licence #327 on 21 July 1928, under newly implemented international reciprocal arrangements. He then joined the staff of Canadian Transcontinental Airways (based in Québec) as a bush and mail pilot, and later flew in the same capacity for Canadian Airways Limited, after that company’s takeover of Canadian Transcontinental. In 1935, he signed on as a test pilot with Fairchild Aircraft of Longueuil, Québec. Among the planes he test-flew during his five years with Fairchild were the FC Super 71 CF-AUJ and all 24 of the Fairchild 82 models produced. Schneider was also a certified Air Engineer. Canada lost an outstanding pilot when Schneider eventually moved to the United States and became a U.S. citizen. There he spent 15 years with North American Aviation in Los Angeles, completing assignments on Sabre Jet and F-100 fighter planes, training NATO troops in the use of jet-engine planes, and instructing the Royal Air Force in the operation and launching of nuclear-tipped Thor missiles. He retired in 1968 to live in San Jose, California. Canadian Airways fonds, Manitoba Archives, M-93-2-12, file 15. Handwritten summary of 1929-30 season Quebec-Seven Islands, etc. By telephone, 28 October 2016. Canadian Airways fonds, Manitoba Archives, M-93-4-7, file 47-4. Pilot file: Alexander S. Schneider. Letter from Alex Schneider to Miss M.G. Fletcher, dated 23 August 1972. As mentioned earlier, Caribou is a very potent Québec drink. Canadian Airways fonds, Manitoba Archives, M-93-4-7, file 47-4. Pilot file: Alexander S. Schneider. A. F. Ingram was manager of Canadian Transcontinental Airways. Le Soleil, 14 April 1930, p. 1. 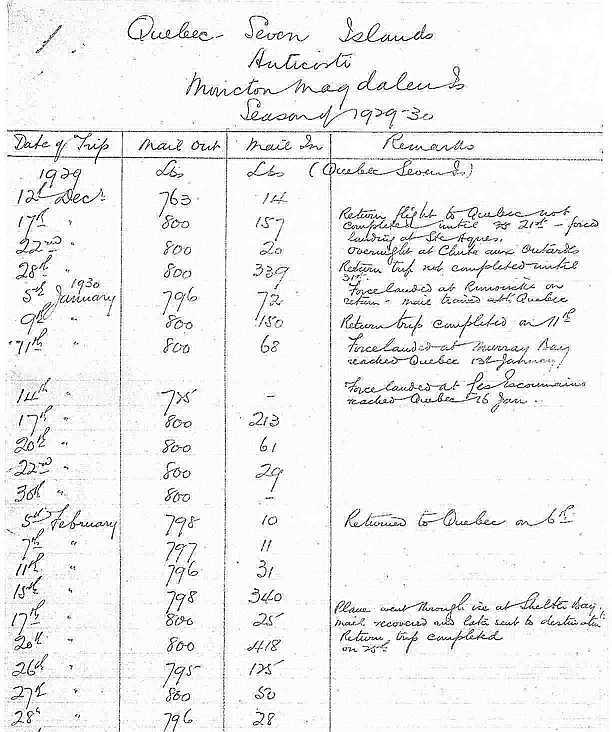 Surviving log books for CF-AAT Fairchild 71 cover the period from July 1930 to March 1936. Canadian Airways fonds, Manitoba Archives, M-93-5-15, file 2 and M-93-6-12, files 5 through 21. In 1929 and 1930, Canadian Airways bought out a number of competitors including both Canadian Transcontinental and International Airways, the company operating the base at Lac-à-la-Tortue. Ken F. Saunders was base manager at Lac-à-la-Tortue. Re Certificate of Airworthiness, note that the Civil Aviation Branch was then part of the Department of National Defence. Details about this particular aircraft are drawn from Library and Archives Canada, Aircraft Registration Files, Fairchild 71 – CF-AAT, Microfilm T-7417. Available online at: http://heritage.canadiana.ca/view/oocihm.lac_reel_t7417/1621?r=0&s=4 Accessed 1 November 2016. Canadian Airways fonds, Manitoba Archives, M-93-4-7, file 47-4. Pilot file: Alexander S. Schneider. Letter from Alexander Schneider to James A. Richardson, dated 12 November 1931. Letter from Alex Schneider to Miss M.G. Fletcher, dated 23 August 1972. Library and Archives Canada/Department of Transport fonds/File 5802-6275: Schneider, Alex Siegfried, 1928-1944. © Government of Canada. Reproduced with the permission of Library and Archives Canada (2016). J. A. Wilson, Controller of Civil Aviation, letter to F. H. Wheeler, Gray Rocks Inn Ltd., 18 January 1940. S. Graham, District Inspector – Civil Aviation, Montréal, internal memo to Controller of Civil Aviation, Dept. of Transport, Ottawa, 12 January 1940. The Artist – The painting of the incident at Shelter Bay on the front cover is by Paddy Gardiner. Paddy was born in 1934 and raised in both the U.K. and Ireland. After apprenticing in aircraft engineering and immigrating to Canada almost 60 years ago, he had various employment, although not always in the aviation field. After the Avro Arrow Affair, he worked in heavy industry, electronics and even installing radio equipment in the Far North. Paddy had an interesting few years working in the survey aircraft modification field. Finally, he was employed by The Boeing Company, which was an enjoyable end to his working days. The art Paddy now does is for relaxation. Many thanks to Diana Trafford, John Davidson and Paddy Gardiner for this article and illustrations; and to Derek Rance and Ian Macdonald for their earlier research on this cover. Great research and write up on the Shelter Bay incident and Schneider.